Malaysia’s former Prime Minister Najib Razak pleaded not guilty to money laundering charges slapped on him on Wednesday, as the country’s new government looked for answers to how 4.5 billion dollars went missing during his tenure. Najib and his wife, Rosmah Mansor, were barred from leaving Malaysia after his decade in power ended in a shock election defeat in May, and the new prime minister, Mahathir Mohamad, relaunched an investigation into 1Malaysia Development Berhad. 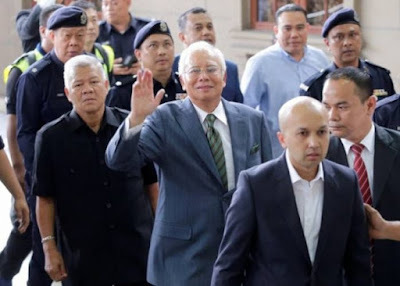 Dressed in a grey suit, Najib appeared calm as three charges of money laundering were read out at the Kuala Lumpur high court. He pleaded not guilty, and was granted bail. Najib has also pleaded not guilty to three charges for criminal breach of trust and one charge for abuse of power that were leveled against him in July. The money laundering charges relate to electronic transfers amounting to 42 million ringgit (10 million dollars) from SRC International, a former 1MDB unit, into Najib’s personal bank account. The offense carries a penalty of up to 15 years in jail and a fine of not less than five times the value of the proceeds of any illegal transfers, or five million ringgit, whichever is higher. Najib was accompanied by his children as he arrived at the courthouse in a four-car motorcade. He left after the proceedings without speaking to the media. “SRC, at the time of the so-called happening, was no longer a part of 1MDB. So it’s got nothing to do with 1MDB…,” Najib’s lawyer Muhammad Shafee Abdullah told newsmen outside the court. SRC, created in 2011 by Najib’s government to pursue overseas investment in energy resources, was a unit of 1MDB until it was moved to the finance ministry in 2012. When asked if he thinks the case was a witch hunt, Shafee said: “My client and I hope that’s not the case”. High Court Judge Mohamad Nazlan Mohd Ghazali said a decision on when the trial begins, and on a gag order issued in July to stop public discussion of the case, would be made on Friday. The scandal at 1MDB fully erupted in 2015 after media reports that hundreds of millions of dollars from 1MDB were diverted to his personal accounts. Najib has consistently denied any wrongdoing, maintaining that those funds were donations from a Saudi royal, and that the bulk of them had been given back. Reopening the investigations into 1MDB after Najib lost power, Malaysian anti-graft officers have revealed how their earlier investigations were obstructed by Najib’s government. SRC has been the initial focus of Malaysian investigators as all the suspicious transactions involving it went through Malaysian entities, unlike other 1MDB-related transactions that went through foreign banks and companies. Money allegedly siphoned off from SRC represents only a small fraction of the billions of dollars misappropriated from 1MDB, according to lawsuits filed in the U.S. courts by the Department of Justice which investigated the scandal. DOJ has alleged that an estimated 4.5 billion dollars was misappropriated from 1MDB by high-level officials of the fund and their associates. 1MDB is being investigated by at least six countries, including Singapore, Switzerland and the U.S., over alleged money laundering and graft. On Monday, Indonesia handed over to Malaysia a 250 million dollars superyacht that had been impounded following claims by the U.S. Department of Justice that it was purchased by fugitive Malaysian financier Low Taek Jho with funds siphoned off from 1MDB.